Duffer bro continues: “That’s why I’m saying it’s YOUR fault.” Dude. DUDE. The director, an adult man, saw that a teen girl was uncomfortable with a situation, which made him MORE EAGER to put her in the situation. Earlier this week Netflix shut down production on House of Cards in the wake of actor Anthony Rapp’s sexual abuse allegations against Kevin Spacey. Today, the streaming service announced it is going a step further, and will no longer work with the actor in any capacity whatsoever. In a statement, Media Rights Capital says that Spacey has been suspended from the production, effective immediately. Production on the show’s sixth season was well underway before Rapp’s allegations surfaced in an interview with BuzzFeed. Spacey responded by coming out as a gay man publicly on Twitter, in what was widely criticized as an attempt to divert attention away from the accusations. Soon thereafter, word broke that the sixth season had already been planned to be the last hurrah for the political drama. On Halloween, both Netflix and production partner Media Rights Capital decided to put production of the series on hold. In the days since, an increasing number of people have come forward with sexual harassment allegations against the actor, with a report from CNN detailing multiple incidents during production of House of Cards itself. 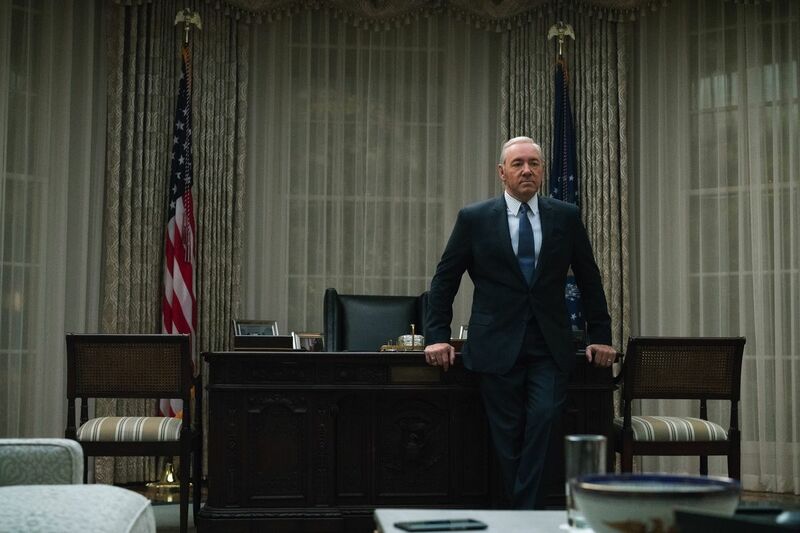 The show’s producers have reportedly been considering ways to move forward, either by killing off Spacey’s character, or perhaps moving to spin-off shows. As for Spacey himself, a representative for the actor said on Wednesday that he is “taking the time necessary to seek evaluation and treatment.” The actor was dropped by both his publicist and talent agency CAA on November 2nd. The drama could join ‘Star Trek’ on the network’s SVOD platform. The Twilight Zone is entering a new dimension. CBS Corp. CEO Leslie Moonves on Thursday announced during the company’s earnings call that CBS All Access is readying a new take on the iconic sci-fi anthology. It’s unclear at the moment if it’s a straight-to-series order or just development. The Rod Serling-created series ran for five seasons on CBS from 1959-1964. Producers CBS Television Studios retained the rights to the cult classic and will executive produce the new take. Sources say the show hails from Jordan Peele’s Monkeypaw banner, with Marco Ramirez (Netflix Marvel dramas The Defenders and Daredevil, Sons of Anarchy) is set to pen the script and serve as showrunner. CBS All Access declined comment on Peele and Ramirez’s involvement as official details have not yet been revealed beyond Moonves’ initial announcement. The news comes as CBS All Access has found success with its revival of Star Trek: Discovery, which the streamer said drove record subscriptions to the platform and has been renewed for a second season. The Twilight Zone joins a roster of CBS All Access scripted originals that also includes dramas The Good Fight (a spinoff of The Good Wife), Strange Angel, $1 and comedy No Activity. Peele found success with the horror feature Get Out, which many have described as an African-American version of The Twilight Zone. CBS last tried to revive The Twilight Zone in 2012 when the studio teamed with  X-Men‘s Bryan Singer to develop, exec produce and potentially direct a new version of the anthology. The network revived the series in the 1980s that ran for three seasons and again in 2002 for a season on UPN with host Forest Whitaker. The franchise has also been licensed to a new stage play set to premiere in December at the Almeida Theatre in London and run through January. The original series won three Emmys during its 156-episode run and explored topics including humanity’s hopes, despairs, prides and prejudices. The Twilight Zone revival arrives as individual episodic anthologies have become increasingly popular following shows like Netflix’s Black Mirror, HBO’s Room 104 and TBS’ The Guest Book. In a crowded landscape of nearly 500 scripted shows, individual episodic anthologies are easier to consume. Meanwhile, reboots and revivals continue to be in high demand as broadcast, cable and streaming platforms look for proven and easy to market IP in a bid to cut through the cluttered landscape. Key to the reboots is having the original producers attached, with would be CBS Television Studios in the case of The Twilight Zone. Peele, whose credits also include Netflix’s Big Mouth, Comedy Central’s Key and Peele and TBS’ The Last OG, as well as the feature Keanu, is repped by CAA, Principato-Young and Morris Yorn. Ramirez is repped by UTA. Celebrities are incensed over Kevin Spacey’s “sincerest apology” to Star Trek: Discovery actor Anthony Rapp. Rapp told BuzzFeed that when he was 14, the House of Cards star, inebriated at a party thrown at Spacey’s apartment, made a sexual advance on the then-underage actor. Rapp said Spacey placed him on a bed and climbed on top of him but Rapp was able to leave before the encounter could go further. Rose McGowan, who is one of dozens accusing Harvey Weinstein of sexual misconduct, urged the media to BE THE VICTIM’S VOICE” and maintain a focus on Rapp. “Help us level the playing field,” she tweeted. Keep focus on #AnthonyRapp BE THE VICTIM’S VOICE. Help us level the playing field. Lance Bass scolded Spacey on Twitter. “Being gay should never be equated with sexual assault or pedophilia. Thanks for giving the homophobes more ammo #KevinSpacey,” he tweeted. Being gay should never be equated with sexual assault or pedophilia. Thanks for giving the homophobes more ammo #KevinSpacey. Thus with one statement “Carson impression at the 2017 Tonys” moves down to 3rd on the list of the worst things Kevin Spacey has ever done. It seems TV viewers were more offended by Adam Sandler touching The Crown star Claire Foy’s knee during Friday’s episode of the BBC’s The Graham Norton Show than she was. The actress issued an official comment saying she took “no offense” after viewers in the U.K. suggested that the actor’s gesture made Foy and fellow interviewee Emma Thompson uncomfortable. The episode is set to air in the U.S. this Saturday and no clip of the segment in question has been officially released yet. After having his hands folded in his lap for the majority of the show, Sandler, 51, placed his hand on Foy’s right knee while telling a story, something he has also done to men. She then picked it up and put it back on his own leg. For readers unfamiliar with Norton’s show, the host brings all of his guests out at once and they share the same couch while drinks flow freely. Foy, 33, did not appear to harbor any lingering ill will afterward. “We don’t believe anything was intended by Adam’s gesture and it has caused no offense to Claire,” her representative told Britain’s Independentand Huffington Post UK. USA TODAY has reached out to Foy’s camp for comment. In a statement to USA TODAY, Sandler’s rep Cindy Guagenti described the incident as “such a non-story” and noted that he did something similar during an interview with Dustin Hoffman on The Tonight Show With Jimmy Fallon earlier this month. However, Sandler’s gesture triggered viewers at home, who tweeted their concern. Star Trek: Discovery actor Anthony Rapp has accused Kevin Spacey of making a pass toward him when he was only 14. In response, Spacey tweeted his “sincerest apology” late Sunday night and came out as a gay man. Rapp told BuzzFeed News in a story that posted online Sunday that the two met in 1986 when both were appearing in Broadway shows (Rapp in Precious Sons and Spacey in Long Day’s Journey Into Night). One night, Spacey invited Rapp to his apartment for a party; later, Rapp says, he found himself bored and watching TV in Spacey’s bedroom when he realized that he was the only one left in the apartment with the actor, who was 26 at the time. The two later crossed paths at the 1999 Tony Awards, where Rapp was performing and Spacey was nominated. He isn’t sure if Spacey has any recollection of the alleged encounter. Spacey, now 58, tweeted a statement late Sunday night in response, apologizing for “what would have been deeply inappropriate drunken behavior.” He said he does not remember the encounter but is “beyond horrified” to hear Rapp’s account. He also notes that he’s had romantic relationships with both men and women, and he’s now choosing “to live as a gay man.” Read his full statement below. Many were quick to criticize Spacey’s statement on Sunday night. And on Monday morning, GLAAD released its own statement ripping Spacey and reminding the public and the media that the focus should be on Rapp’s tale of survival and his decision to speak out. “Not to simply air a grievance, but to try to shine another light on the decades of behavior that have been allowed to continue because many people, including myself, being silent.… I’m feeling really awake to the moment that we’re living in, and I’m hopeful that this can make a difference,” Rapp said.